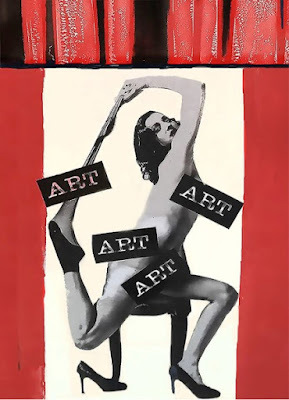 Those of you who aren't Facebook friends with me or Linda may not be aware of what has been going on with her art. 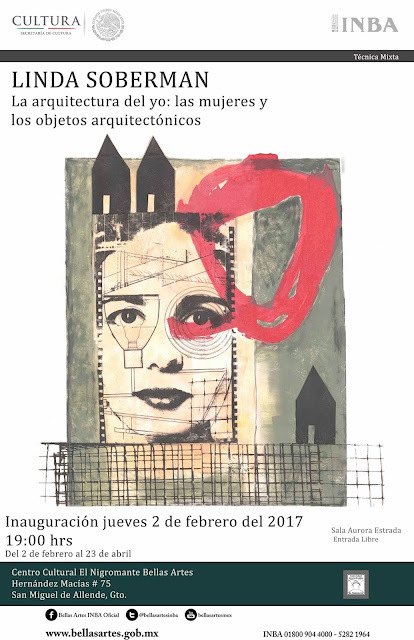 Last month she had an opening at Bellas Artes (the premier museum in San Miguel). It is still up until April 23. 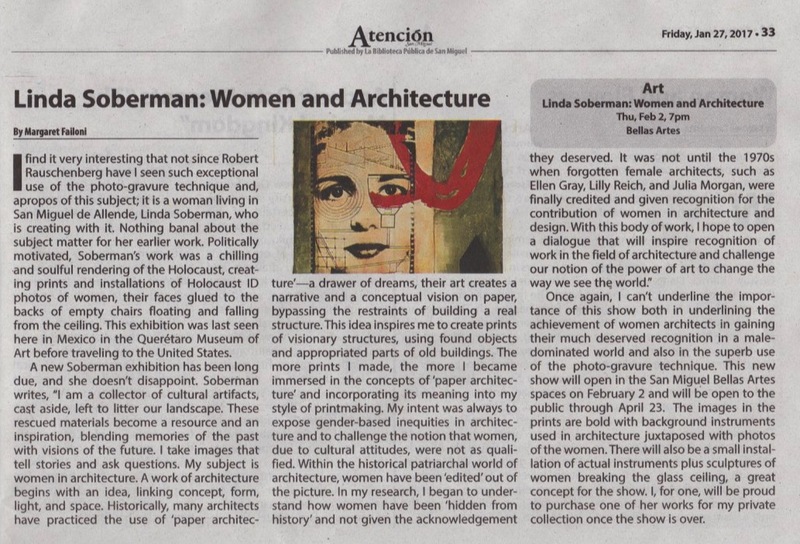 The subject is women and architecture. It was very well reviewed in the Atencion, our local English language newspaper. Linda was interviewed and a short video is showing in the entry to the gallery. The video can be viewed on Youtube. Then, Linda was also interviewed by Sheila Sabine, who interviews artists who live in interesting homes. See the interview by clicking on this link. Finally, this week Linda is one of the prime movers of a show called Nasty Women, where works by many San Miguel artists are being sold for $100 each, with proceeds going to several local charities - CASA and Mujeres en Cambio. You may not have noticed that it has been a long time since I have published a new blog entry. As in about 2 years. A lot has happened during that time, and it's not likely that I'll ever fill in all the blanks. Instead, I'll let you know what's happening now. Some of you read the blog because you had donated to the computing center in Rancho San Francisco outside of San Miguel. The update to that subject is that things are going very well indeed. The Computing Center is open six days a week and is generating sufficient income to pay the salaries of the young women who supervise the facility. The building is clean, neat and well maintained, and most of the computers are working well. The internet connection has proven to be reliable, and we have been given an increase in connection speed at no cost. This week we finally finished construction of a pavilion under which about 50 of the students will be able to eat their lunches, and whether the school can conduct classes, meetings, etc. Moreover, the pavilion will also be available for the use of the entire community. This is the way the pavilion now looks. The picnic tables have not yet been put together, but should be installed in the next week or so. My eternal thanks to those of my friends and family who have donated to make this project possible. The pavilion will be decorated with artwork - possibly mosaics - by the schoolchildren. Linda will be spearheading this project. In the course of completing the pavilion, I learned about another organization in San Miguel dedicated to providing clean water to the San Miguel area - Caminos de Agua. I found out that most of the drinking water in San Miguel is contaminated with, among other things, arsenic and fluoride. While a little fluoride is a good thing - it protects teeth from decay - excessive fluoride can severely stain teeth. Caminos de Agua has designed inexpensive systems to collect and filter rainwater into cisterns and provide clean, safe drinking water. All that is needed is a roof and a cistern. And guess what? The new pavilion and Computing Center both have roofs of sufficient size to provide drinking water for the entire school! We are in the process of working with Caminos de Agua and a committee of parents to determine whether the community would like to put a drinking water system in the schoolyard. As with the construction of the Computing Center and the pavilion, we (my friends and family) will provide the funds for the cistern itself, and the community will pay for or provide the labor for installation. I will keep you posted. I will endeavor to update this blog with some regularity, and let you know about what is going on in our lives and especially in San Miguel.